One of these days it will be acceptable to put Guild Master, Dungeon Master, Game Master or any variation of the Leader of a group of people involved in a fictional world setting, on your resume. I would like to think that day is coming sooner rather than later. That six years as an Assistant Guild Leader in World of Warcraft can actually mean something to other people. The world of Social Media Work Experience has been limited to such things as Facebook and Twitter or other platforms of that sort. I think businesses are missing out on a huge platform with Online Gaming and MMO’s in particular. So when is the next step in the development of our computer age? Most people my age have grown up watching the evolution of the Social Media craze. If they are like me, they have been playing MMO’s continuously for the past 15 years. If you have been a guild master of an online community or been the dungeon master for a local table top game, then you know how much work and time go into running such a thing. There have been times when it is Blood, Sweat and Tears to get your team together. The Koreans are ahead of us in the Computer Age. They have Sponsored Sports Teams of Video Game Players. People get PAID to play video games. That is the name of a still active guild in WoW now run by my good friend Adeatheta. My husband was/is Jerix. We have since stopped playing WoW for personal reasons. You can look up the information about both the character and the guild online. It will show you the guild standing, activity of the character. Damn near everything the player has done over the life of their game play. It really is not much different than companies who check out a persons Facebook page to see what they are saying in their personal time. We have ALL heard that story. Why not learn that the person you just interviewed has been running a top level raiding guild for the last 7 years, achieved World first or Server Firsts due to excellent skills in People management and time management? I would be interested in learning those things. You can damn well bet that when it comes time for me to hire someone to help assist me as a writer, I am going to be asking for game experience! Like most avid fans of the EQ franchise, I was excited to learn they were working on another. Part of me screamed “Please God don’t let them screw this up!” remembering the fiasco we endured with Star Wars:Galaxies. A fantastic game that was essentially killed when they “revamped” the game to be class based instead of the popular profession based game that it was. I learned that SOE Live would be streaming through Twitch.tv and made sure to log on with over 10 thousand other viewers to watch, hoping for some breadcrumb to be tossed our way about the much anticipated game. We were not too disappointed. The only snippet they offered to whet the appetites of the fan base was a brief play of the “early stages music”. Which, in my opinion, was a brilliant move on their part. And I had just won tickets to an indie writers panel in Seattle from 10am to 12pm!! Oh what a world! I made it to the panel which I will blog about later. It was worth it! I was able to catch up via my bud and Streamer Kalbuir of Twitch.tv about the basics of what was covered at the event. Then I found EverQuest Next on YouTube and filled myself in on everything I had missed. What he revealed on that stage left me in awe. They had done it again. EverQuest Next takes all of the best aspects of all of the most popular games out there today combining them in such a way as to create an experience like no other. 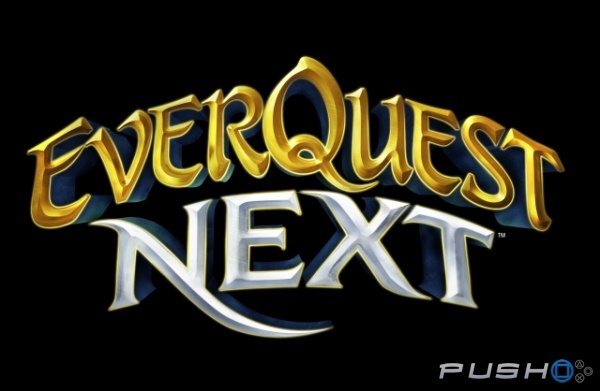 Just like EverQuest in 1999, EverQuest Next promises to be revolutionary to the world of online video games. But they didn’t stop with an amazing game. Oh no. Slow your roll here…did that just say Free To Play? Say What? Landmark is a sandbox game like Minecraft, unlike Minecraft it is an MMO like most others you are familiar with. Head off into the world to explore the land. When you find a place you want to claim as yours, place your flag and go town! Or should I say Build your town! For the first time in MMO history, the players are being given the chance to create the world we will be playing in. Dave explained that Landmark will have events open to the players allowing them to build, under specific needs of the devs, the buildings and places that will be part of EverQuest Next. The players vote on the buildings and the best one wins! As a fan of Minecraft and a builder of huge stadiums in that world, I am extremely excited about this. I will definitely be online building in hopes to win the prize! As a writer, I know that word of mouth is one of the best ways to generate a fan base. MMO’s are really no different. I hope my excitement about this new game has come through. Encouraging you to check it out and join me when Landmark opens this winter. For more information about the game and to keep up to date on it as it developes go to http://www.everquestnext.com. Don’t forget to sign up for Beta! What are you most excited for with EQN? Leave a comment!